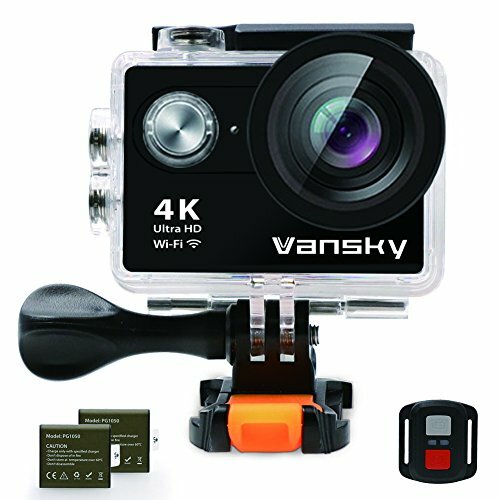 4K Waterproof WiFi Action Camera!! Sweet Deal!! 100 FEET WATERPROOF CAMERA: IP68 certified rugged waterproof housing supports diving depth up to 30m(100ft). All buttons can be operated while the case is on. Perfect for water sports like Diving, Swimming, Drifting, Surfing, etc. The Underwater Camera helps you explore the unknown underwater world. 2.4G WIRELESS REMOTE CONTROL SPORTS CAMERA: Controlling the camera, framing shots or recording video while Hiking, Biking, Skiing, Bungee and so on are now ultra convenient with the Remote Control. Wireless range up to 10m(33ft). Built-In Wi-Fi & APP CONTROL: Compatible with IOS and Android devices. Scan the QR code on the manual and download the APP. Easily control the camera and manage the photos & videos on your phone. Save and share those moments anytime anywhere Wi-Fi signal ranges up to 10 meters. USB DUAL BATTERY CHARGER: Come with 2 rechargeable 1050mAh batteries, each battery can record up to 90 minutes. And USB dual battery charger, enable charges two camera batteries at the same time. Just enjoy your recording and no worry about the battery life of action camera.